The ObusForme Lumbar Support Cushion provides superior comfort for your back wherever you sit! The Lumbar Support Cushion also helps prevent tendency to slouch and helps to enhance sitting posture, whether you are working, watching television, or reading. With the soothing massage feature, you will forget that your are correcting your posture. 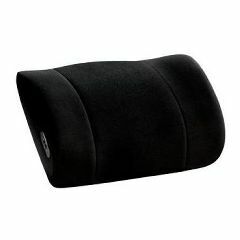 The Lumbar Support Cushion also features an adjustable strap, so you can secure the cushion to any chair. Soothing massage helps relax back muscles. Helps prevent slouching and betters sitting posture. Adjustbale strap holds cushion side to side to any style of chair. Great for home, in the car or at the office.